The Carbone Boot Camp seminar is custom designed for the restoration and remediation business professional. If your business specializes in water damage, fire damage, mold and microbial remediation, my program lays out a clear and strategic plan that you can implement immediately to generate much higher revenues and from a wider variety of revenue streams. This program is the product of over seven years of field-tested experience – techniques that I have refined and improved upon as a business development professional within the industry while being in one of the most competitive markets in the US. 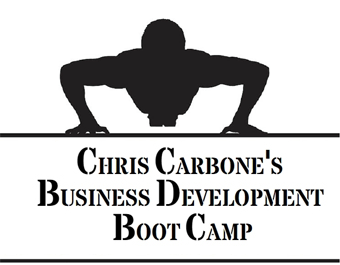 I recently had the amazing experience of attending Chris Carbone's Business Development Boot Camp. To say this class was worth it is an understatement! The techniques, strategies, and practices Chris uses and shared with us that day were top notch. I just wish I would have done it sooner, issues where we felt like we are spinning our wheels were covered by Chris and now seem all but fail- proof! I personally feel Chris has something to offer to everyone and I strongly advise individuals to learn from one of the best! Once I learned about Chris Carbone's Boot Camp, I immediately signed up myself and my salesperson, Mike Knight. In the past, Chris was always making himself available to answer any and all of my questions pertaining to sales. His Boot Camp nonetheless did not disappoint! In fact, Mike and I came away from that seminar recharged, renewed with the sales ammunition and know-how to attack the market. Mike and I spoke for hours on the car ride home planning how we would best put Chris's techniques into action in our area. Brilliant. So worth the money spent. The boot camp Chris put on was terrific. I will send any Business Development agent I hire to his class. He presented the best sales information and education I have received since purchasing my business. He made it enjoyable and engaging- we will implement some of his strategies as soon as this week. The full day class really helps retaining ideas and strategies and getting digital copies of the marketing material that work for him will allow for quick implementation. Thank you. On Friday, June 20th I attended Chris Carbone's "Boot Camp" seminar. The class was extremely informative, as well as a great venue for fostering innovative ideas to market potential customers. In my opinion, this is a "MUST" class for any restoration sales professional to take. There was a continuous flow to the seminar and Chris is the ideal "classroom teacher" who adds a flavor of humor to the learning that made it truly enjoyable. Chris, thanks so much for the awesome Boot Camp! We are starting to employ some of the great tactics that you shared with us during our training, with great success! I think that the Boot Camp was a great idea and that we got to learn from one of the Best in the Business. You are an amazing teacher and I feel that we learned a great deal from you. In time, we will be able to put together a more aggressive marketing strategy thanks to you and your seminar! Thanks again Chris! I wanted to thank you very much much for organizing the seminar. I found it extremely helpful and very informative; you covered everything a new salesman should know. I think, that each starting sales team member should have an advantage of participating in such a seminar. It would help them to become a better marketer sooner. Also, the material you gave us is great and I am certain it will prove very helpful when I put it all to use. The creative ideas you shared with us are priceless. I enjoyed every single minute at the seminar, and the time flew by so quickly! Thank you! Three short days after the class, I had the opportunity to experiment a bit with what I had learned. Our franchise sponsored a continued education class and I was surrounded by 35 insurance professionals. Being in his class gave me the boost in confidence I needed to speak with insurance agents and adjusters in the language that they understand and can appreciate. I highly recommend this course to anyone serious about success. It's no coincidence that Chris Carbone’s franchise in Northern New Jersey went from a company in the red, to one of the top franchises in the world in a few short years with him at the helm! Chris has a proven track record of being one of the best when it comes to developing and nurturing business. When he speaks, it's clear that he has a passion for our business and for teaching others to succeed!